Various stretches of beach, maybe? Anyway, I'm not sure there's a whole lot of words where this is possible. I sort of stumbled on these with the help of a (long) list of 9-letter words and the Internet Anagram Server. So what's up with the sudoku, you ask? Well, a week or two ago I was writing a couple of pages for the DMG about puzzles, and learned some things about how to make them. I like solving puzzles, though not ordinarily in the context of a D&D game. Anyway, last night I was home alone, at the end of a very long week of work (at the end of a very long month), and I was back in the situation I was in during my vacation in September: I didn't know what to do with myself without working. 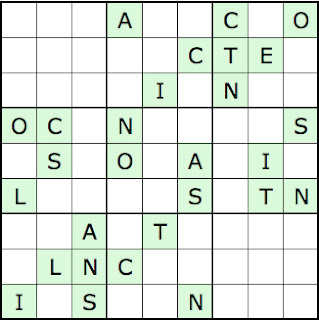 So I did the Scientific American Sci-doku, and the question occurred to me of whether you could do such a puzzle with two words, rather than just one. The intersection was interesting, so I went looking for words that would work in parallel. I stayed up way too late last night working on this one. The problem was not making the letters fit, but coming up with a set of givens I could put them into. I opted for an easier pattern today and managed to finish it, so hopefully I'll be able to sleep tonight.